Q & A: What is the crime of aggression? Every few weeks, another country agrees that it too will support the suggested amendments to the ICC’s Rome Statute regarding ‘aggression’. But for most of us, it’s not clear what effect that amendment will have and what it really means. Here’s an explanation from Justice Hub. Q: What does it mean when international courts talk about aggression? There’s a difference between the act of aggression – which is committed by a state – and the crime of aggression – which is committed by an individual with a high military or political profile. Q: How can a state be responsible for aggression? This is a concept which has only emerged during the last century. After the Second World War, aggressive war or ‘war of aggression’ was defined at the international tribunals in Nuremberg and Tokyo, as an international crime. Q: But don’t states have the right to defend themselves? Yes, states do have the right to defend themselves. But only the UN Security Council can say whether an act of a state is considered an act of aggression, and the UNSC can authorise use of force against any state that wages unjustified wars. Q: What about the crime of aggression? The crime of aggression is a leadership crime. It’s related to acts committed by state officials who are in a position of high political and/or military responsibility – the ones with authority in the decision-making process of waging wars and the illegal use of force. Q: Has the ICC ever tried individuals for the crime of aggression? No, not yet. That’s what the potential amendment to the Rome Statute is all about. The last time an international court tried someone for aggression was at Nuremberg, where members of the former Nazi regime were on trial. Q: How has the ICC come up with a definition for aggression? The UN passed a resolution in 1974 that detailed aggression. The use of armed force by a State against the sovereignty, territorial integrity or political independence of another State, or in any other manner inconsistent with the Charter of the United Nations, as set out in this definition. Q: Is that the same as the one at the ICC? It’s basically the same. 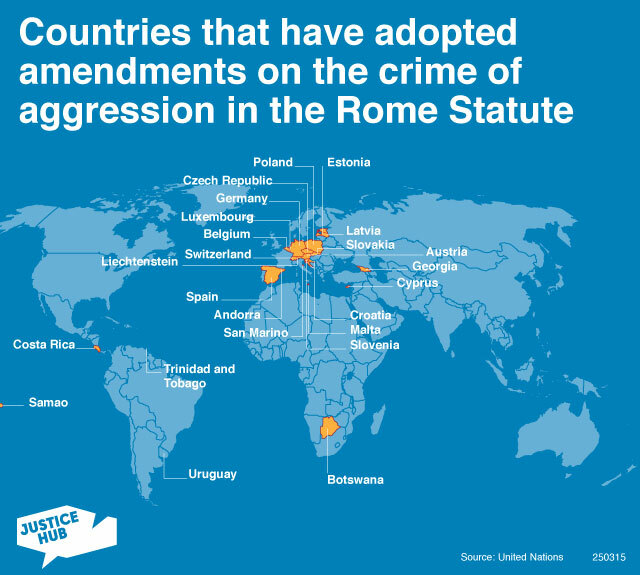 The Rome Statute would have a new Article 8 bis, which defines the crime of aggression. A briefing from the UN says that three elements are needed for something to be a crime. “First, the perpetrator must be a leader, i.e., a “person in a position effectively to exercise control over or to direct the political or military action of a State”. Second, the Court must prove that the perpetrator was involved in the planning, preparation, initiation or execution of such a State act of aggression. Third, such a State act must amount to an act of aggression in accordance with the definition contained in General Assembly Resolution 3314, and it must, by its character, gravity and scale, constitute a manifest violation of the UN Charter. Q: So who could be tried? The briefing says that “this implies that only the most serious illegal uses of force between States can be subject to the Court’s jurisdiction. Genuine cases of individual or collective self-defence, as well as action authorised by the Security Council, would thus clearly be excluded”. Q: So what’s happening with this amendment? It’s a complicated procedure because the amendment is so controversial. First, it was discussed by states for several years to try to come up with a formula that could be acceptable. Then that formula was discussed at a separate review conference in Kampala, Uganda in 2010. Now countries are signing up to that amendment. Q: How many have signed up? This week brings it to 23. But only if 30 states sign up by 2017 would it have a chance of going through. Q: What happens in 2017? Any time from 1 January, the countries that belong to the ICC – the Assembly of States Parties – can vote on the amendment. But two-thirds of all the member states would need to agree to the amendment for it to kick into force. Q: Could my leaders be affected? If your country has signed up to the ICC, yes. If not, then only if the UNSC gets involved could your leaders face a charge of aggression at the ICC. Those are some of the checks and balances put into the details to try to get it accepted by the widest possible grouping.